This article is about the type of terrain. For other uses, see Badlands (disambiguation). Badlands are a type of dry terrain where softer sedimentary rocks and clay-rich soils have been extensively eroded by wind and water. They are characterized by steep slopes, minimal vegetation, lack of a substantial regolith, and high drainage density. They can resemble malpaís, a terrain of volcanic rock. Canyons, ravines, gullies, buttes, mesas, hoodoos and other such geologic forms are common in badlands. They are often difficult to navigate by foot. Badlands often have a spectacular color display that alternates from dark black/blue coal stria to bright clays to red scoria. Badlands are partially characterized by their thin to nonexistent regolith layers. The regolith profiles of badlands in arid climates are likely to resemble one another. In these regions, the upper layer (~1–5 cm or 0.4–2.0 in) is typically composed of silt, shale, and sand (a byproduct of the weathered shale). This layer can form either a compact crust or a looser, more irregular aggregation of "popcorn" fragments. Located beneath the top layer is a sublayer (~5–10 cm or 2.0–3.9 in), below which can be found a transitional shard layer (~10–40 cm or 3.9–15.7 in), formed largely of loose disaggregated shale chips, which in turn eventually gives way to a layer of unweathered shale. Badlands such as those found in the Mancos Shale, the Brule Formation, the Chadron Formation, and the Dinosaur Provincial Park can be generally said to fit this profile. In less arid regions, the regolith profile can vary considerably. Some badlands have no regolith layer whatsoever, capping instead in bare rock such as sandstone. Others have a regolith with a clay veneer, and still others have a biological crust of algae or lichens. In addition to lacking significant regolith, they also lack much vegetation. The lack of vegetation could very well be a result of the lack of a substantial regolith. The formation of badlands is a result of two processes: deposition and erosion. The process of deposition describes the accumulation, over time, of layers of mineral material. Different environments such as seas, rivers, or tropical zones, deposit different sorts of clays, silts, and sand. For instance, the badlands formations in Badlands National Park, South Dakota, United States underwent a 47-million year period of deposition which spanned three major geologic periods (the Cretaceous Period, the Late Eocene, and the Oligocene Epochs), resulting in clear, distinct layers of sediment which serve as a dramatic display of the law of superposition. Once the deposited sediments have solidified, the sedimentary material becomes subject to erosion. It is sometimes erroneously taught that badlands erode at a steady rate of about one inch or 25 millimetres per year. In actuality, the precise processes by which the erosion responses take place vary depending on the precise interbedding of the sedimentary material. In 2010, researchers at Badlands National Park initiated a three-year project to learn more about the actual erosion rate of the specific badlands found in that park. Some of the best-known badland formations can be found in Canada and the United States. In the U.S., Makoshika State Park in Montana and Badlands National Park in South Dakota together form a series of extensive badland formations. Also located in this region is Theodore Roosevelt National Park, a United States National Park composed of three geographically separated areas of badlands in western North Dakota named after former U.S. President Theodore Roosevelt. Petrified Forest National Park in Arizona which is part of Navajo County encompasses numerous bad lands that also abuts the Navajo Indian Reservation and is directly North of Joseph City, Arizona. Many dinosaurs are believed to be buried in the immediate area and exploration has been ongoing since the early 20th century. Among the Henry Mountains area in Utah, about 1,500 m (4,900 ft) above sea level, Cretaceous and Jurassic aged shales are exposed. 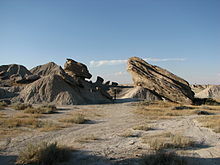 Another popular area of badland formations is Toadstool Geologic Park in the Oglala National Grassland located in northwestern Nebraska. Dinosaur National Monument in Colorado and Utah are also badlands settings, along with several other areas in southern Utah, such as the Chinle Badlands in Grand Staircase-Escalante National Monument. A small badland called Hell's Half-Acre is present in Natrona County, Wyoming. Additional badlands also exist in various places throughout southwest Wyoming, such as near Pinedale and in the Bridger Valley near the towns of Lyman and Mountain View, near the high Uintah Mountains. Pinnacles National Park in California also has areas of badlands, as does the Mojave Desert in eastern California. El Malpais National Monument in western New Mexico is named after the Spanish word malpaís, meaning bad lands. The Big Muddy Badlands in Saskatchewan, gained notoriety as a hideout for outlaws. There is a large badland area in Alberta, particularly in the valley of the Red Deer River, where Dinosaur Provincial Park is located, as well as in Drumheller, where The Royal Tyrrell Museum of Palaeontology is located. A well-known badlands formation in New Zealand – the Putangirua Pinnacles, formed by the erosion of the conglomerate of an old alluvial fan – is located at the head of a small valley near the southern tip of the North Island. Other badlands can be found in Italy, known as "Calanchi". Some examples include Aliano, Basilicata, and Crete Senesi, Tuscany. The Bardenas Reales near Tudela, Navarre, and the Tabernas Desert in Tabernas, Almería, and possible Los Monegros in Aragon, all of them in Spain, are examples in Europe. The Valle de la Luna ("Valley of the Moon") is one of many examples of badland formations in midwestern Argentina. This geologic formation is the only place in the world where nearly all of the Triassic is represented in an undisturbed sequence of rock deposits. 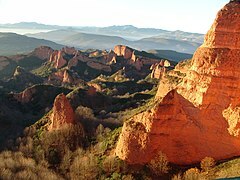 Although most badland scenery is natural, there are some examples produced by mining, such as the Roman gold mine of Las Médulas in northern Spain. An example of badlands produced by poor farming practices is the Cheltenham Badlands in Caledon, Ontario. Badlands incised into shale at the foot of the North Caineville Plateau, Utah, within the pass carved by the Fremont River known as the Blue Gate. ^ "Badlands" in Chambers's Encyclopædia. London: George Newnes, 1961, Vol. 2, p. 47. ^ Bryan, R. and A. Yair, 1982a. Perspectives on studies of badland geomorphology. In Badland geomorphology and piping. R. Bryan and A. Yair (eds), 1-3. Norwich: Geo Books. ^ "Badlands National Park South Dakota". November 7, 2013. ^ a b "Badlands Erosion Rates". ^ Thomas, D. (2011). Arid zone geomorphology: Process, form and change in drylands. (3rd ed.). Wiley. 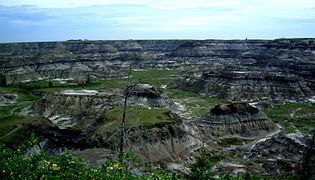 Wikimedia Commons has media related to Badlands. Look up badlands in Wiktionary, the free dictionary. The Badlands: Nature’s Time Capsule – Documentary about the badlands of South Dakota. "Bad Lands" . New International Encyclopedia. 1905.